What? What is this you speak of? Isn't it normally Monday weigh in missus? It is and I did weigh myself yesterday but events took over and I never got a chance to do a post. -1lb. It could have been so much better but I'll take any loss. If you put on 1lb or 2lb you really notice it. I've come to learn over these months that a loss is worth a smile and it should give you some pleasure. If it doesn't then you need to give yourself a slap. Its all good. Up to Friday I have to say I was outstanding on the food front. I really feel I've conquered my snack binging and I don't pig out after a Monday weigh to celebrate a loss or commiserate a gain. I find this is what you always do when you join a slimming club. I truly feel free of the slimming club merry go round. I had also worked out 3x prior to Friday. 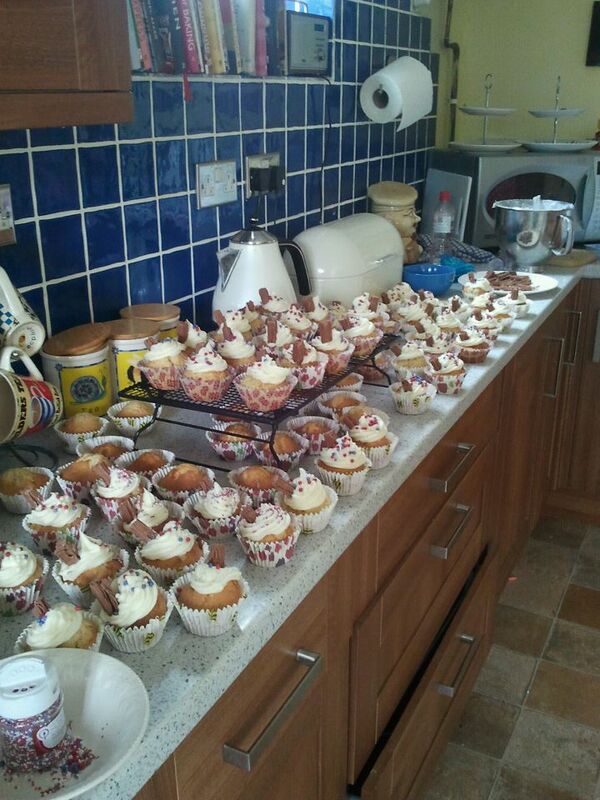 Then I did some extreme baking for the summer fair. 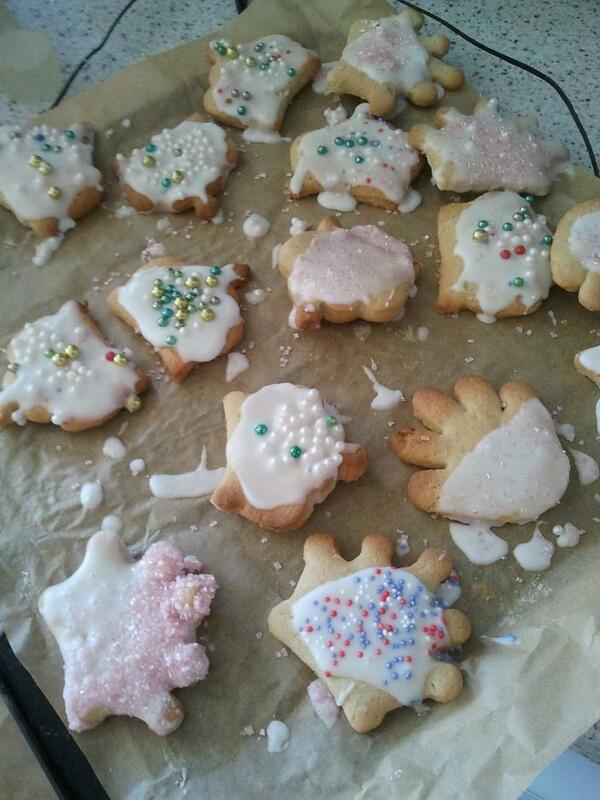 I got a bit carried away and when it came to digging out my crown biscuit cutters I lost the will to decorate them. Hence the state of them. I was also reporting Bannergate on the phone to the police (see previous post). So I did have 2 x cupcakes in the course of that day and tested a biscuit. Other than that my food intake was fine - nice and healthy and portions were a slimmers size. Enter children. My son who seems to have seasonal asthma (first discovered this when he was 6 on sports day) had a cough and cold all week. On Thursday he had been coughing in the early hours so we both didn't get much sleep. I gave him cough medicine and his inhaler. I should have kept him off but I sent him in and told the teacher (the same teacher I have complained about as she makes my daughter cry every Thursday) that he was to miss PE and to phone me if he wasn't well. So when I pick him up on Friday she says "oh I let him sleep for 20 minutes". Another teacher came out too and seemed to be cross about it all - she said "he was lying on the floor when I looked at him". I knew immediately that this was him struggling to breath (he's shy my son so he didn't say I need to go home etc despite my briefing him). I took him to the doctors and thankfully didn't have to go to A&E. There is a point with asthma of no return. He was prescribed antibiotics and steroids. Saturday I ran the Racing Royals game at the school fair. What is it with kids these days? Every child was like "what's the prize if you win?". They were only interested if the prize was deemed worthy. Anyhow the fair was a bit flat and less than a third turned out - approx £2,000 was made. That night we had a Chinese take-away. I had lemon chicken but also had some ribs, prawn crackers, special fried rice and prawn toast washed down with some wine. Good job my week had been good as there's no way I would have lost anything. Early hours of Monday morning my daughter is coughing and the dent (I don't know the technical name) of her collar bone is going in and out like mad. The doctor said on Thursday that this is a dangerous sign as it means the child is struggling to breath. So I kept her and my son off school yesterday. All 3 were home and I managed to get the housework done but not much else. So I went to bed a 5pm yesterday hence the no blog post. I also took my daughter to the doctors today (missing her sports day) and she now has an inhaler but it may just be cold induced. This poxy 'summer' weather is to blame - one minute cold, next sunny. Oh a pair of black stretch jeans from M&S arrived and they fit lovely! So today I am working out for the first time since Thursday and lets hope everything runs smoothly from today onwards. Onwards and downwards! Thank you for the competition this week, it really helped me stay on the straight and narrow. Very happy that we're both such losers. Next week I'm going to slaughter you (figuratively speaking that is). I will blog about all this one day soon but only when I've lost enough to make it worth writing about. So far only 2.6kg (about 5/12 lbs). Great post Natasha. Hope the kiddies are well again really soon.